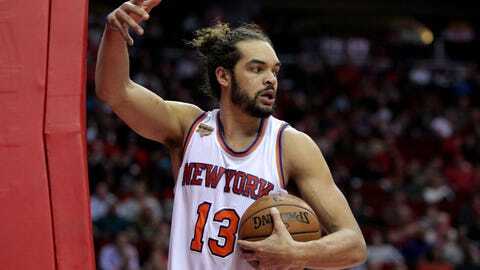 Joakim Noah is continuing to hear the critics regarding his starting center spot with the New York Knicks. It seems as if the honeymoon stage for Joakim Noah and the New York Knicks has come to an end rather quickly during the halfway point of year one. Noah, who signed a four-year, $72 million deal this past summer to join former Chicago Bulls teammate Derrick Rose in New York, became the new starting center. The New York native was looking to rebuild his reputation after an injury-filled season last year in Chicago. Instead, he’s continued with the kind of ailments that hampered the Knicks early in the season with hamstring and ankle injuries. The criticism largely stems from the contract value as many believe Noah should be producing more statistically. It’s almost impossible to expect the same Noah that had multiple double figure assists games back in Chicago to return, almost like asking for “MVP” Derrick Rose. The court vision and awareness to grab key offensive rebounds continue to be strong attributes regardless of whether he’s lost a step or two. Noah is still without question the anchor of the defense on and off the court. A team filled with players known for being great scorers back in their primes, Noah is constantly shown in games, barking out defensive assignments, putting others in defensive positions and hustling for the extra possessions. It’s similar to having an extra coach on the floor considering how fiery and vocal he is every minute in the game. The growth of rookie Willy Hernangomez and evolution of Kyle O’Quinn as the backup big men has been in large part to Noah’s presence. O’Quinn has dedicated himself to crashing the boards and has had a few big games this season, but he lacks consistency. Hernangomez is young and shows flashes of greatness, but is a liability at times defensively while still adjusting to the NBA game. Noah’s limited started minutes give these guys plenty of time to excel against most team’s second units. A thriving young Kristaps Porzingis will constantly be faced with many bruisers in most NBA frontcourts looking to get in his head. It’s always helpful to have a fearless veteran ready to play the “bad cop” role during the occasional scuffle. The bond between Rose and Noah continues to be strong in New York since the two time NCAA National Champion was the only person Rose contacted when he went “missing” last month. There is no sugarcoating all of Noah’s abilities, as his glaring detriments include the various injuries and woeful free throw shooting. Noah is amongst the worst in the league in free throw percentage, becoming a liability in late games and a recent nominee on Shaquille O’Neal‘s infamous “Shaqtn’ A Fool” segment of the NBA on TNT. The Noah contract will remain a constant topic of criticism as long as the Knicks continue to struggle. It would be premature to take him out of the starting lineup this early in his Knicks tenure unless he is being shopped for potential trades you will more value with him starting rather than on the bench.